Click Here to Submit for Brother of the Month! Bryson Paul Brooks is a Spring 2019 initiate of the Alpha Upsilon Chapter, and is affiliated with the designated colony at Georgetown College. He is a freshman Business Administration major. He is a member of the Georgetown College football and track teams. He is a native of Paducah, Kentucky. Bryson is committed to academic and athletic excellence. He understands that one must have a well-rounded collegiate experience. Through his fraternal membership, he endeavors to be of service to others and to ensure that Kappa Alpha Psi has a notable presence on Georgetown's campus. He is grateful for the inspiration his mother has provided in raising him to be a respectful and honorable gentlemen. His family lives by the tenets in I Thessalonians 5:18 - "Give thanks in all circumstances". We salute Bryson Brooks as a neophyte brother who brings wisdom of hope and goodwill. Gil Barksdale was born in Pittsburgh, Pennsylvania but was raised in Solon, Ohio. He is currently a junior student athlete at Vanderbilt University majoring in Medicine, Health and Society with a minor in Psychology. On the field, he plays free safety for the Commodores where he has lettered for the past 3 years and been awarded to the SEC Academic Honor Roll. He is a Spring 2018 initiate of the Nu Rho Chapter of Kappa Alpha Psi Fraternity, Inc.
His biggest role model in his life is his father, Dr. Edward Metz Barksdale. From a young age, his father instilled in him and his siblings a blue collared working mentality in their approach to life and their various endeavors. With Gil's future aspirations to become a physician, his father’s career as a pediatric surgeon has been enlightening. Furthermore, his father’s commitment as an active servant leader within the Cleveland community has inspired Gil to seek opportunities to give back. In his free time, he enjoys volunteering as a mentor with The After School Program (TAP) and as a volunteer at Second Harvest Foodbank. He also enjoy sports, reading and listening to podcasts, and traveling. A true advocate of Phi Nu Pi and a great young man, Gil represents Kappa Alpha Psi Fraternity, Inc. in all that he does. Brother Cameron M. Wilson is a Sophomore at Rust College in Holly Springs, Mississippi. He is a Fall 2018 initiate of the Zeta Omicron Chapter. Brother Wilson is a Mass Communications major. He is a presidential scholar and has a 3.84 grade point average. He is a well-rounded student with active campus involvement: Freshman Class Elections Commissioner, Sophomore Class President, Chaplain for the campus chapter of the National Association for the Advancement of Colored People, Student Ministry Fellowship Member, and a Residence Hall Assistant. He was a Project Transformation Tennessee Intern where he focused on civic engagement and youth empowerment. 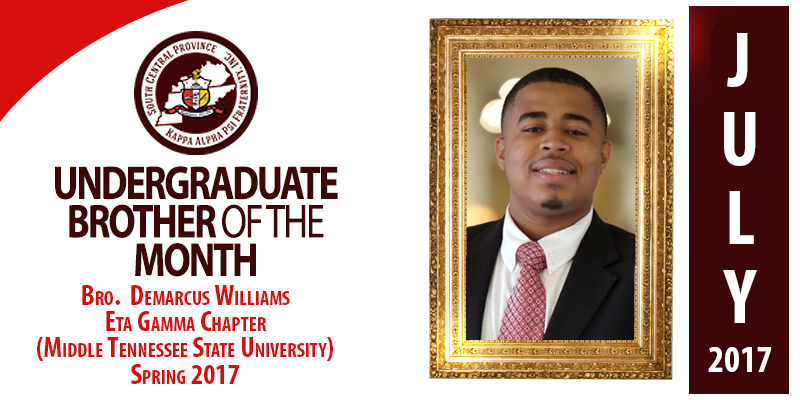 He is the Polemarch of the Zeta Omicron Chapter and has led the chapter in strengthening its commitment to the fraternity’s mission and goals. At the Fall 2018 Membership Training Academy Pinning Luncheon, he was selected to give the Invocation, His inspiring words focused on biblical concepts from the book of Proverbs. Brother Wilson recently attended the National Founders’ Day Observance and Undergraduate Summit where he garnered broader insight on organizational effectiveness and programmatic objectives. Brother Wilson is a native of Columbus, Mississippi. He is the son of Michael and Rashun Wilson. During his matriculation at Columbus High School, he was an achiever: academically, athletically and artistically. 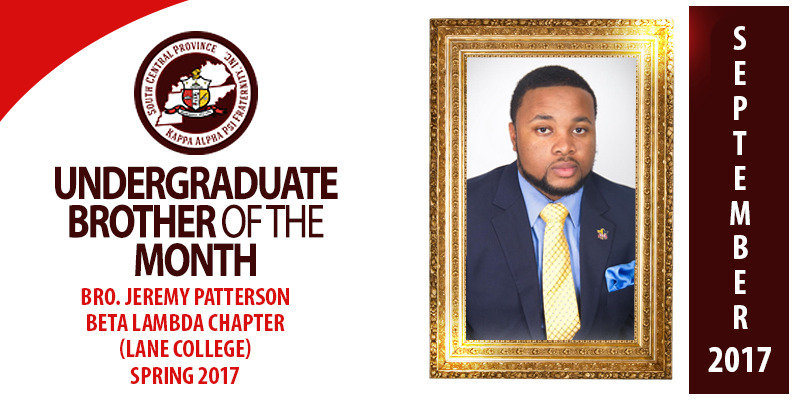 Through Brother Wilson’s association with current Province Junior Vice Polemarch, Jeremy C. Patterson, he has garnered a commitment to understanding that “excellence is a habit and not an act”. Watez Phelps, son of Watez and Natashia Phelps, was born and raised in Evansville, Indiana. Watez is currently a senior attending The Kentucky State University. He is studying music education with a concentration in piano. Watez is a Fall 2017 initiate of the Alpha Upsilon chapter of Kappa Alpha Psi and will be serving at the Polemarch for the 2018-2019 academic year. Watez is also heavily involved within his campus. He serves as a peer tutor for the Academic Center of Excellence where is job is to tutor students in historically difficult classes. Watez serves as a Resident Assistant on campus where he works to build community and tend to the needs of students in the resident’s halls. He will also be serving as the President of the Kentucky State University Chapter of Kentucky Educators Association where his focus will be in recruiting and exposing more young black aspiring educators to the wonderful and rewarding world of education. Watez also plays in a band on campus named Underground Atmosphere that performs in various campus events and others events around Kentucky. This past semester Watez has served as a piano instructor with the Key to the Community Links program a non-profit organization that serves to teach children the piano. With all that he is involved in he works hard to maintain a 3.7 gpa and participate in benevolent service opportunities. By doing so, he prepares himself to become a well-rounded professional. With doing these things as well as maintaining good character, one puts themselves in good position to receive countless opportunities for achievement. Mustafa Ali-Smith is a Chicago native and was raised in Nashville, TN. He currently attends the University of Tennessee, Knoxville with a major in Public Administration and minors in Leadership Studies & Political Science. Bro Ali-Smith is a Fall 2017 initiate of the Mu Rho Chapter of Kappa Alpha Psi. Throughout Mustafa’s life, he has been placed in numerous circumstances that have shaped him to be the man he is today. Because of these circumstances he thrives in environments where diverse perspectives and skill-sets are valued. Furthermore, he has grown to believe that it is our soulful duty to participate in civic engagement to ensure we are forever committed to the growth of our great nation and world. During Mustafa’s college career, he has had the opportunity to serve in several leadership capacities including the founding of the Student Political Alliance, a nonpartisan, non-profit, public issues and idea based forum in Knoxville, TN. Through the organization's mission, he is able to emphasize the importance of civil dialogue among our world’s most pressing topics, encourage civic engagement, and ensure that members of the organization are fostering a social impact within their communities as it relates to politics. Additional involvements of Mustafa include his contribution to the Daily Beacon, the University of Tennessee, Knoxville’s student run newspaper, where he serves as an opinion’s columnist. In this capacity Mustafa’s work has been feature in physical copies of the newspaper as well as online distribution in the University of Tennessee’s newsletter. Mustafa also serves as the President of the University of Tennessee Knoxville Chapter of the National Association for the Advancement of Colored People where he has been recognized for his involvement for progressing marginalized groups on campus. More recently, he was featured in Knoxville’s ABC News speaking about the importance of minorities in the 2018 midterm elections. In the facets Mustafa serves in, he realizes that the future has much in store for us. Upon graduation he will be moving to Washington D.C. where he will be teaching English through Teach For America. After completion he wishes to attend law school in, where he will be better equipped to serve the community and ensure a just society. Jacarri Relf is a native of Chicago, IL. He attends Lane College, where he is a junior studying Mass Communication. Bro. Relf is a Spring 2018 initiate of the Beta Lambda Chapter of Kappa Alpha Psi Fraternity, Inc. Early on, Jacarri understood the importance of hard work, dedication, and perseverance. His Father, Walter Relf, was a semi-pro football player, and his Mother, Joanne Townsend, earned her science degree at Olive Harvey College. By the time Jacarri made it to middle school at Perspectives IIT Math & Science Academy, he was considered a model student. He was an Ambassador for the school, giving potential students and families tours of the campus; furthermore, maintaining a 3.5 while doing so. In the 12th grade, Jacarri was featured on ABC news for the second time. He co-organized an annual peace march where students peacefully protested against violence. As a result of his dedication to being a leader on his campus, Jacarri was awarded an ADL (A Disciplined Life ) Award, along with being crowned Salutatorian at his 2016 graduation. He gave a moving speech to his entire school, along with his ill Mother in attendance. When Jacarri was two years old, his Mother, Joanne Townsend, was diagnosed with Huntington’s Disease. He and his Father spent their whole lives taking care of her, until her death this past February. Even though Jacarri lost his Mother, he was determined to fulfill his last promise to pledge Kappa, and he did so. He also continued to achieve. Over the summer, Jacarri received a paid internship in Atlanta, working for Aspire TV; which was owned by Irving “Magic” Johnson. While there, he networked with celebrities, directors, and executives prominent in the black entertainment industry. He also learned new ways to use cameras for his creative passions, such as the open mics he hosts on his campus. Weeks before the internship ended, Jacarri lost his Grandmother to natural causes. He was stunned by the news, yet, he continued to persevere. Upon arriving back to college for the Fall 2018 semester, Jacarri was featured on the Lane College Facebook page for his internship, along with pictures he’d taken for his college’s mass communications department. Brother Patrick Cephus is a current senior at the University of Memphis studying Political Science major, Double minor in Criminology and Afro American studies with the hopes of becoming an attorney. Brother Cephus has served Kappa Alpha Psi Fraternity, Inc. in numerous capacities since his initiation. Brother Cephus was initiated through the Kappa Beta chapter in the Spring of 2018, and was immediately elected Chapter Polemarch. Following the 73rd Province Council Meeting he was appointed to serve on the South Central Provincial Board as an undergraduate board member (Region 3) under the leadership of Province Polemarch Leonard Clemons. He also serves as an intern for the District Attorney’s office of the City of Memphis and operates a summer camp for at risk youths of Shelby County. Bro. Cephus remains committed to Academic Achievement while still maintaining numerous leadership positions on campus including the NPHC, Black Scholars and the NAACP. AJ Richardson from Clarksville, TN, played football and basketball at Kenwood High School. He also played football his freshman and sophomore year in college. He is an upcoming Senior at Austin Peay State University, business marketing major, and a Fall 2016 initiate of Alpha Kappa Psi business fraternity and Spring 2017 Initiate of the Theta Beta, None Greater chapter of Kappa Alpha Psi fraternity Inc.
During the Spring semester of 2018 he had multiple opportunities at internships locally and nationally but he chose the one that would be the most uncomfortable for him, because he wanted to experience something different and develop a new craft. Before his initiation into Kappa Alpha Psi, he founded Kloset Kleanerz which is a non-profit organization that is geared towards giving quality clothing back to people who are less fortunate. He is planning to graduate in May 2019. After graduation, his current internship (Penske) will make him a full time manager at a branch of his choice. With a bachelor’s degree in business, AJ serves his community in anyway that he can. From donation of clothing, feeding the homeless, and running business professional seminars for students in the community. With all of that being said he wants to make the final statement saying that you should always live selflessly and not selfishly. Dillon Douglass, the son of Mary and Charles Douglass, is a native of Jackson, TN where he is an active member of Greater St. Luke Baptist Church. Dillon is a rising senior majoring in Athletic Training at Middle Tennessee State University with a current GPA of 3.88. Bro. Douglass is a Spring 2018 initiate of the Eta Gamma Chapter of Kappa Alpha Psi Fraternity, Inc.
Bro. Douglass serves as the Keeper of Records for the Eta Gamma Chapter. He was recently given the distinction of a Kappa Fellow upon his completion of the fraternity’s Undergraduate Leadership Institute. Dillon enjoys serving as a mentor to the youth in organizations such as Building Brothers and Sister of our Community and the Middle Tennessee State University’s Scholars Academy. He also has been involved in the Student Government Association, Student Athletic Training Association, Iota Tau Alpha Honor Society. He was named Tennessee Athletic Trainers’ Society Undergraduate Student of the Year for 2018. Dillon currently serves as a Sports Medicine intern for the Minnesota Vikings for their Preseason and Training Camp for the 2018 season. His ultimate goal is to serve as a Head Athletic Trainer for a Professional Sports Franchise. Jeffery Patton is a native of Senatobia, MS. He attends the University of Mississippi, where he is junior studying Integrated Marketing Communications. Bro. Patton is a Spring 2017 initiate of the Lambda Pi Chapter of Kappa Alpha Psi Fraternity, Inc. Early on, Brother Patton understood that many of his accomplishments would not have been possible if someone had not believed and invested in him. With this understanding, he spent a great deal of his Sophomore year at Oxford High School working with their AVID Tutoring program. The program aims at tutoring freshmen and sophomores who will be first generation college students. Bro. Patton plans to continue working with this program in the upcoming semesters to give back what was given to him. Brother Patton has served as the 2017-2018 Polemarch for his chapter and currently serves as the South Central Province (Region 4) Undergraduate Board of Director. He is devoted to contributing not only to his chapter, but also the fraternity as a whole and to keep this bond of fraternity growing stronger throughout his years. School in Hendersonville, TN where he ran track, and played football. He was the 2nd African American Quarterback in school history. He also let his team to their 5th Blue Cross Bowl State Championship game appearance. He has taken an active role in various programs and activities at Tennessee State University. Jeremias is a former president of Architectural Engineering Institute, current member of American Society of Civil Engineers, National Society of Black Engineers, and National Association for the Advancement of Colored People. strives for excellence in all fields of human endeavor. Jujuan Lewis (Spring 2017 initiate) is a Junior Finance Major from Chattanooga,Tennessee. As a future investor and commercial banker, he believes that community engagement comes first. As a local community member, he wants to restore the values once held by Chattanooga officials. He believes his efforts will one day help children in need.This has lead him to such notable positions as NPHC President, SGA external Communications Director and Community Service Chairman for the Lambda Iota of Kappa Alpha Psi Fraternity, Inc.
His mission is to foster inner city youth in financial literacy. He is also on the Dean's Student Advisory Council which allows him to make decisions with corporations such as TVA, Unum and EPB for UTC’s College of Business. Other organizations he has been involved in include; the finance club and CEO clubs which help incoming students get acquainted with UTC’s business-oriented campus. Recently, Lewis has been elected as UTC’s SGA President, giving a voice for students and his community. Courtney Covington was born and raised in Memphis, TN. He currently attends Austin Peay State University in Clarksville, TN where he is a junior studying Interdisciplinary Studies – Pre-K through 3rd grade elementary. Mr. Covington is a Spring 2017 initiate of the Theta Beta Chapter of Kappa Alpha Psi Fraternity, Inc. In addition, Courtney is involved in a host of different campus organizations including Austin Peay’s Student Government Association and Omicron Delta Kappa honor society. He serves as the president of the Mt. Zion Baptist Church college ministry organization on campus. He is a mentee in the Achievers and Scholars African American Male Mentoring Program at APSU. He also plays a vital role on various university committees where he serves as a student representative. As a result of searching for opportunities to assist in the building of a community on campus for first generation students, Courtney serves as a peer coach for seven students in the Trio student services support program. Courtney continues to seek out other opportunities in the community and on campus to further develop his leadership, communication and networking skills so that he can have all the essential tools to be successful in every field of human endeavor. Mr. Covington lives by two essential scriptures. Proverbs 3:5-6, reads, “Trust in the Lord with all thine heart; and lean not unto thine own understanding, and in all thy ways acknowledge him, and he shall direct thy paths”. An Island boy at heart, scholar, activist, fitness enthusiast, and future life coach, Travis Richards is a rather exceptional brother. Mr. Richards is a graduating senior at American Baptist College, where he will receive a degree in Behavioral Studies. Mr. Richards is a Presidential scholar, maintaining a 3.66 GPA from his freshman to his senior year. He has been recognized as a recipient of the Who’s Who Among Students in American Universities & Colleges. During his undergraduate years, he has made a great commitment to community outreach. Richards has volunteered at the Hope CDC Freedom School as a Communication Specialist, and served as a STEAMS project lead manager, where he helped over 1,200 Nashville high school seniors celebrate their achievement at American Baptist College’s Senior Day. Additionally, he served as an Intern for the Christian Alliance for Orphans as their Research, Social Media & Communications specialist. Mr. Richards’ other community service activities include, being a mentor of the Truth Initiative’s Youth Activism Fellowship Program, serving as Polemarch of Alpha Delta Colony, and acting as Deputy Media Director for Lonnell Matthew’s Juvenile Court Clerk campaign. Social Justice is an important factor that drives Bro. Richards. He has plans to create a nonprofit catering to minority-based communities, that will assist with the development of ones’ authentic self. He wishes to construct safe havens where youth can develop communication skills, coping mechanisms for day to day life and ultimately become the change agents that will break the systemic chain that has stigmatized, profiled and dehumanized brown bodies for centuries. Bro. Richards was initiated to the bond in the Spring of 2017. He has used achievement as the fundamental foundation of academic, and community outreach excellence. Bro. Richards has recently been accepted into Goldsmiths University in London, where he will pursue a Masters Degree in Media, Culture and Race. While becoming a first-generation graduate, Richards feels that he will have an opportunity to make a great impact on the word. Taking one step at a time, with diligence in his efforts and Kappa in his heart, he will surely attain this achievement. Myles Harris is a current sophomore at Fisk University in Nashville, TN where he majors in Business with a concentration in Finance & Economics. Myles is a Fall 2017 initiate of the Alpha Delta chapter of Kappa Alpha Psi and is very involved on his campus. Myles serves as the current Class President and was selected as a campus ambassador for his university. Myles is a member of the Student Advisory board at Fisk and has also served on the Student Judiciary Committee. Myles is a Fisk University Presidential Scholar and maintains a 3.9 GPA. He was given the distinguished honor of being a Vinson & Elkins LLP Scholar where he has been awarded a four year paid internship with the accomplished corporate law firm. Brother Harris was recently selected into the Bluford Healthcare Leadership Institute and will be interning this summer with the Institute, learning more about public policy and healthcare law from leading professionals in the field. As a brother, Myles has organized with his chapter a winter canned food drive and donation movement that provided supplies to the Nashville Rescue Mission to feed the homeless in the Nashville Community. Brother Harris has volunteered his time helping students at the Nashville Boys and Girls Club, and at the Andrew Jackson Community Center where he serves as a mentor to the youth. He has also tutored elementary and middle school students at the Spruce Street Baptist Church, and started an annual campus wide clothing drive with his friends called Blessed to be a Blessing. Brother Harris plans to pursue a Master’s degree in business or attend law school after graduating from Fisk. Myles wants to be a corporate attorney before moving into investment banking and real estate. His ultimate goal is to one day pursue politics in hopes that he can make a true change and uplift the youth in black communities in America. A Louisville native, Brother Nuri Thompson is currently a junior at the University of Louisville (Alpha Omicron Chapter) where he majors in Communication and minors in Pan-African Studies. Brother Thompson is heavily involved with campus life, he is a founding member and the media coordinator of Voices in Action, a student-led organization that focuses on social justice efforts on campus and in the Louisville community. He is a Martin Luther King Jr. Scholar, one of the highest honors scholars program for students of color focusing on issues of social justice. He has also been an active member in the Students for Students mentoring program, which prepares middle and high school students for college. Brother Thompson is also a member of the Malcolm X Debate Team, where he has won multiple awards at the regional and national level. Thompson has also served as a keynote speaker at the Martin Luther King Jr. Hope Breakfast. In addition to the work that he does on campus, Brother Thompson has shown a dedication to his community through multiple volunteering projects, including the English Conversation Club at the Louisville Free Public Library where he has taught immigrants and refugees English in order to prepare them for citizenship and daily life in the United States, the Youth Debate Program at Neighborhood House where he teaches skills of public speaking and advocacy to low-income students of color, and the high school debate program at the J. Graham Brown School where he coaches debate at the high school level. Malcolm Dorsey is currently a junior at Middle Tennessee State University where he majors in African Studies and has a double minor in Sociology and Social Welfare. A Spring 2017 initiate of the Eta Gamma Chapter of Kappa Alpha Psi Fraternity, Inc,. Brother Dorsey was elected Vice-Polemarch of the Eta Gamma Chapter of Kappa Alpha Psi. As a brother, Brother Dorsey works diligently in continuing the relations with local alumni, Murfreesboro Alumni Chapter, assist in implementing programs that improve social relations on campus and within university Greek life, and serves in any capacity that enhances the chapter. Dorsey’s involvement on campus extends well beyond Kappa. He has served on the election commission for Student Government Association, chartered a new student organization, Middle Tennessee State University Black Pre- Law Society, and is an involved member of Alpha Kappa Psi, Fraternity, Inc. Brother Dorsey was also elected as the 2017 Homecoming Step Show Coordinator. Though committed to on-campus endeavors, Brother Dorsey also is committed to inspiring service in the public interest in his local community. Brother Dorsey has coached youth football and serves as local youth president for the Rutherford County Branch of the National Association for the Advancement of Colored People. After graduation, Brother Dorsey intends to attend Law School. Where he will pursue a Juris Doctorate in Family Law. Jeremy C. Patterson, the son of James Patterson and Venus Loffman, is a rising Criminal Justice Major at Lane College in Jackson, Tennessee. Jeremy is a native of Cleveland, Mississippi, and is a 2015 graduate of Rosa Fort High School in Tunica, Mississippi. He has taken an active role in various programs and activities at Lane College. Jeremy currently works with the athletic program serving as the Student Linebacker Coach and Quality Control Coordinator for the Lane College Football Team. He is mentored by Derrick Burroughs, Athletic Director and Head Football Coach. Jeremy previously served as the Head Football Coach for a semi-pro team in Cleveland, Mississippi from 2012-2015. He completed a record of (41-9) and back-to-back Magnolia League football championships. He is a Spring 2017 initiate of the Beta Lambda Chapter (Lane College) of Kappa Alpha Psi Fraternity, Inc. His exceptional leadership skills and charisma positioned him to be elected as Polemarch (President) of the Beta Lambda Chapter as well as being selected as the South-Central Province (Region) Undergraduate Board Member from Region 3. Jeremy also serves as the Chairman/Chief Executive Officer of Patterson Pro Academy, a nonprofit organization designed to help “Engage, Educate and Empower” young men. Jeremy is very involved in community service endeavors. He has participated in serving meals to the homeless and mentoring young students. He is a distinguished achiever: academically and athletically. He strives for excellence in all fields of human endeavor. We are pleased to meet Demarcus Williams of the Eta Gamma Chapter at Middle Tennessee State University. Demarcus Williams is a senior at Middle Tennessee State University majoring in Computer Information Systems with a minor in Business Administration. He aspires to be an IT consultant and also work for a major sports team dealing with Business Analytics. He enjoys to cook, collect Afrocentric art and also has a passion for the youth of the Murfreesboro Community. Before becoming a member of Kappa Alpha Psi he was the President of Collegiate 100 Black Men of MTSU. There he raised over $500 with the help of his fellow members to give back to the Murfreesboro City Schools. He currently was recently selected to join LEAD Kappa at the 83rd Grand Chapter Meeting where he hopes to connect and network in order to receive a job. Brother JerMilton Woods is currently entering his senior year at Tennessee State University where he majors in Exercise Science with a minor in Philosophy . He was initiated into the Alpha Theta of Kappa Alpha Psi Fraternity, Inc. in the spring of 2017. Brother Woods humbly ended his junior year with a 3.2 cumulative grade point average. Immediately after initiation, Brother Woods was elected Chaplin of Alpha Theta Chapter of Kappa Alpha Psi Fraternity, Inc. and Undergraduate Board of Director for the South Central Province. This summer, Brother Woods has been working with his church youth department as Youth & Young Adult advisor. Entering into his senior year, he has become the President of SGA (Student Government Association). Brother Blake Scott is currently entering his junior year at Northern Kentucky University where he majors in Accounting with a minor in Business Administration. He was initiated into the Pi Pi chapter of Kappa Alpha Psi Fraternity, Inc. in the spring of 2017. Brother Scott humbly ended his sophomore year with a 3.2 cumulative grade point average along with being and Honor Society nominee. Immediately after initiation, Brother Scott was elected Polemarch of the Pi Pi Chapter of Kappa Alpha Psi Fraternity, Inc. and he, amongst other brothers of Pi Pi have taken several steps to the betterment of the community, such as a canned food drive event and a campus church service. Also, he has pushed for more inclusion amongst organizations on campus. This summer, Brother Scott will be working with Envision Children, a summer schooling program that will aid the learning of early age children in somewhat troubled communities. Entering into his junior year, he has become a member of NABA (National Association of Black Accountants) hopes to land an accounting internship in preparation for the future. Brother Victor Rounds is currently a junior at Vanderbilt University where he majors in Engineering Science with a concentration in Human Centered Design. He was initiated into the Nu Rho chapter of Kappa Alpha Psi Fraternity, Inc. in the spring of 2016. Over the past academic year, Brother Rounds has been developing a revolutionary crib mobile in partnership with his school's radiology department and the Monroe Carrell Jr. Children's Hospital. He serves in a number of leadership positions on campus and is additionally working on his second self-help book, entitled Know Yourself: The Pith of Success. Directly pertaining to the fraternity, Brother Rounds has achieved two outstanding accomplishments in the past month. He was selected to take part in this upcoming summer's LEAD Kappa leadership development program in Orlando, FL. There, he will gain valuable training and knowledge that will mold him into a more capable and effective leader in a number of different ways. Not only was Brother Rounds selected to participate in the highly competitive LEAD Kappa program, but he was also named ‘Outstanding New Fraternity Member of the Year’ by Vanderbilt University’s Alexander J. Heard Greek Awards. Additionally, he and several other members of Nu Rho (Brothers Trey Ellis, Gregory Rudd, Denzel Washington, and Ralph Webb) were selected as "Outstanding Vanderbilt Greeks" for their academic achievement and extracurricular involvement. Brother Rounds will be working with Verizon this summer as a Product and Software Development intern in Atlanta, GA. After graduation in May 2018, he plans to launch a career in product development or product management. Brother Frank Edward Burns Jr. is currently a junior at Austin Peay State University where he majors in Public Health with a minor in Political Science. A fall 2016 initiate of the Theta Beta Chapter of Kappa Alpha Psi Fraternity, Inc., Brother Burns has humbly served in whatever capacity the fraternity has requested. Immediately after initiation, Brother Burns was appointed Polemarch of the Theta Beta Chapter of Kappa Alpha Psi Fraternity, Inc. Furthermore, though Brother Burns enjoys service and commitment to Kappa Alpha Psi, he is also a heavily involved as a student leader on the campus of Austin Peay State University. Brother Burns serves as the junior senator representative in Student Government Association where he will be running for student body president this upcoming spring, president of the NAACP collegiate chapter at Austin Peay State University, founder of “Scholars. Leaders. & Gentlemen Society” student organization, student representative of Austin Peay Hearing Board, student representative of Austin Peay Diversity committee, member of Gov’s Programming Council and has also served as the student representative of the Austin Peay Disabilities committee. Brother Burns is committed to “Achievement in every field of human endeavor” and it is demonstrated not only through his campus involvement, but community service and academic pursuits. In the community, Brother Burns volunteers at the local Salvation Army feeding the homeless, while also being heavily involved in local NAACP community projects as well as Habitat for Humanity projects. Brother Burns additionally works with the Clarksville, Tennessee Child Serves, and has headed multiple cancer awareness fundraisers where proceeds are donated to St. Jude’s Research. Burns has also interned with the City of Knoxville’s Director of Public Assembly, Greg MacKay, where he worked with event planning for the city of Knoxville, Tennessee. Brother Burns has maintained a 3.57 grade point average and is a part of the Golden Key National Honor Society. Brother Burns has also received acknowledgement on the university’s Dean’s List. After graduation, Brother Burns intends to attend graduate school to pursue a master’s degree in Occupational Therapy. Brother Christopher Cross is currently a junior at the University of Mississippi where he majors in Philosophy and has a double minor in Public Policy Leadership and English. A Spring 2016 initiate of the Lambda Pi Chapter of Kappa Alpha Psi Fraternity, Inc, Brother Cross has humbly served in whatever capacity the fraternity has requested. Immediately after initiation, Brother Cross was elected Vice Polemarch of the Lambda Pi Chapter of Kappa Alpha Psi. Furthermore, in the summer of 2016, Brother Cross was appointed to serve on the South Central Provincial Board as undergraduate board of directors under the leadership of Province Polemarch Leonard Clemons. Brother Cross also serves on the South Central Province Expansion Committee where he works with brothers across the province to help charter new chapters. Though Brother Cross enjoys service and commitment to Kappa Alpha Psi, he is also heavily involved as a student leader on the campus of Ole Miss. Brother Cross serves as chief of staff for the vice president of the Black Student Union, President-Elect of the Ole Miss Student Alumni Council, member of the Ole Miss Wesley Foundation, member of the Ole Miss College Democrats, and a member of Associated Student Body Senate Elections Taskforce Committee. Brother Cross additionally works as a second-year community assistant for the Ole Miss Department of Student Housing. Brother Cross is committed to “Achievement In Every Field of Human Endeavor” and it is displayed not only through his campus involvement, but community service and academic pursuits. In the community, Brother Cross volunteers at local nursing homes, mentors high school and college freshmen, and occasionally writes for his church’s newsletter. Cross has also interned with the Mississippi Northern Public Service Commission where he worked with utility, energy, and consumer protection issues in north Mississippi. Brother Cross has maintained a 3.71 grade point average and is a part of the nationally recognized Sally McDonnell Barksdale Honors College where he is currently writing his honors thesis analyzing the actions of Biblical figures through Kierkegaardian ethics and moral fallibilism. After graduation, Brother Cross intends to attend Emory University’s Center for the Study of Law and Religion where he will pursue a Juris Doctor in Law and a Master of Theological Studies. Brother Patrick Smith is a current senior at the University of Kentucky studying Marketing and Business Management with a minor in communication and journalism with hopes of becoming an attorney. Brother Smith has served Kappa Alpha Psi Fraternity, Inc. in numerous capacities from the moment he was initiated. Brother Smith was initiated through the Kappa Tau chapter in the Spring of 2014, and was immediately elected Keeper of Exchequer. During his junior year, he was appointed to serve on the South Central Provincial Board as an undergraduate board member under the leadership of Past Province Polemarch Byron D. White, while still maintaining numerous leadership positions on campus including the NPHC and SGA. Brother Smith was also selected to participate in the L.E.A.D. Kappa program, a leadership training program held 4 days before each Grand Chapter Meeting, sponsored by notable Fortune 500 companies such as Sam’s/Wal-Mart and General Electric, in the summer of 2015. While in the program, Brother Smith had the opportunity to bond with brothers from all over the country and other universities and network with key executives. He also could develop and improve both professional and networking skills while attending the 82nd Grand Chapter meeting. Brother Smith went on to serve as the Vice-Polemarch and MTA Chair for the Kappa Tau chapter, positions he still holds. Brother Smith made it his mission to make sure the chapter was as visible as possible on campus through his involvement and dedication to helping the youth all while maintain a 3.6 GPA throughout his time at UK. Brother Smith’s involvement on campus extends well beyond Kappa. During his junior year, he served as the first generation and transfer student coordinator for the Student Government Association and was elected the President of the National Pan-Hellenic Council, a position he also currently holds. As president, Patrick has helped advanced the NPHC tremendously. He has helped start new traditions and events, formed new relationships, and increased campus’ awareness regarding both the NPHC and the minority population. His leadership and involvement has not gone unnoticed. His strong network at the University of Kentucky with students, faculty, administration, and the community earned him the 2016 Most Valuable Greek Award, 2015 South Central Province Brother of the Year Award, 2015 Kappa Tau Nupe of the Year Award, and most recently 2016 Homecoming King, becoming only the second African-American male in the history of the University of Kentucky to win the award. Brother Smith has completed two internships during his undergraduate career, gaining valuable experience in both the field of business operations and legal industry by working as a finance intern for a Fortune 500 company in Illinois and a strategic planning intern for Turner Broadcasting. Brother Smith continues to strive for achievement in every field as he continues to achieve within the community, university, and our fraternity. Brother Denzel Washington is a current senior at Vanderbilt University studying Civil and Environmental Engineering and Engineering Management. Brother Washington has served Kappa Alpha Psi Fraternity, Inc. in various capacities from the moment he stepped into Kappa Land. Once initiated through the Nu Rho chapter in the spring of 2014, Brother Washington stepped up to the plate and served his chapter in the role of social chair. During his junior year, he was appointed to serve on the South Central Provincial board as an undergraduate board member under the leadership of Past Polemarch Byron D. White, while maintaining key leadership positions with many on-campus organizations such as NSBE and ASCE. Brother Washington was additionally accepted into the Lead Kappa program, a leadership training program held 4 days before each Grand Chapter Meeting, sponsored by notable Fortune 500 companies such as Sam’s/Wal-Mart and General Electric. During the program, Brother Washington was able to bond and network with brothers from all over the country and develop key professional and networking skills all while in his hometown of New Orleans, Louisiana. Brother Washington went on to serve the Nu Rho chapter as Polemarch for the 2015-2016 fraternal year, working diligently to train a new set of leaders within Kappa Alpha Psi. During his tenure as chapter Polemarch, Brother Washington wanted to ensure that his chapter stood out to make a difference in their respective community. Washington has been able to strengthen his leadership skills all while maintaining above a 3.0 throughout his time at Vanderbilt. Brother Washington’s involvement in his university and within the fraternity spoke volumes which in turn paved the way for him to serve on the national board for Kappa Alpha Psi. Brother Washington currently serves as the fraternity’s Grand Lt. Strategus for the 33rd Grand Administration of Kappa Alpha Psi Fraternity, Incorporated. Brother Washington has been granted the opportunity to serve under our noble Grand Polemarch, Brother Thomas L. Battles, where he proudly represents the strong leadership that our province has shown over the years. Along with his leadership in Kappa Alpha Psi, Brother Washington has maintained a strong network at Vanderbilt University with campus faculty and administration earning him the 2015-2016 Greek Leaders Award. Brother Washington has completed two internships during his undergraduate career, gaining valuable experience in the field of engineering and engineering management by working with two of the highest ranked construction management and engineering consulting firms. Brother Washington continues to show his colors as a true embodiment of achievement in every field as he continues to achieve within our fraternity, his education, and throughout his profession.